Whether you’re taking a day trip to the beach or a few weeks to adventure across the country, your vehicle is not only your method of travel, it’s the place you’ll spend the majority of your time. As such, it’s a good idea to make sure that your car is outfitted for such expeditions, both for function and convenience, as well as comfort! To help you best prepare your car for those epic road trips, we’ve put together a list of the best car accessories for travel on Amazon. Check it out—you’re bound to find something useful for your next trip! From your triple-shot latte to your oversized reusable water bottle, the standardized cup holders in your car just don’t cut it sometimes. That’s where the BottlePro Adjustable Car Cup Holder comes in. It takes those too-tiny cup holders and turns them into something useful – functional, even. It is both adjustable and extendable, allowing it to fit the vast majority of cup holders and beverage vessel. There’s even an included soft-fit foam sleeve that allows for the perfect custom fit! Good snacks are one of the highlights of a road trip. Whether you’re a candy lover or more of a salty snacker, you’re going to have wrappers to discard and trash to throw away. Doing so while on-the-go can be difficult, though, unless you have the Drive Auto Products Car Trash Can. This handy little innovation can be placed or hung anywhere in your vehicle thanks to its integrated straps, and even includes enough liners to get you started. It’s waterproof, so it won’t leak even if your trash does, and incredibly durable. This package even comes with a spare, allowing you to collect twice the trash or use it for in-car organization! Whether you prefer some extra privacy or want to keep the interior temperature of your vehicle a little more stable, the A1 Shades Windshield Sun Shade is the perfect product. It comes in several different sizes to ensure the proper fit and is exceptionally convenient to store, collapsing in a matter of moments. It’s always nice to have a product that serves multiple purposes, and this is one of those products. From blocking out the summer heat and protecting your interior from UV rays to keeping curious eyes off your personal belongings, this sun shade is a must-have for car travelers! From taking a quick nap to keeping the glare out of sensitive eyes, the kinder Fluff Car Sun Shade is a valuable addition to any expedition. This kit includes four sun shade (two transparent and two semi-transparent) to cover all your travel needs. They can be used individually or overlap depending on the amount of coverage you need, allowing you to customize your experience to your exact preferences. On top of that, they install in seconds and can fold for storage just as quickly, making them ideal for the changing weather conditions your sure to encounter on your journey. 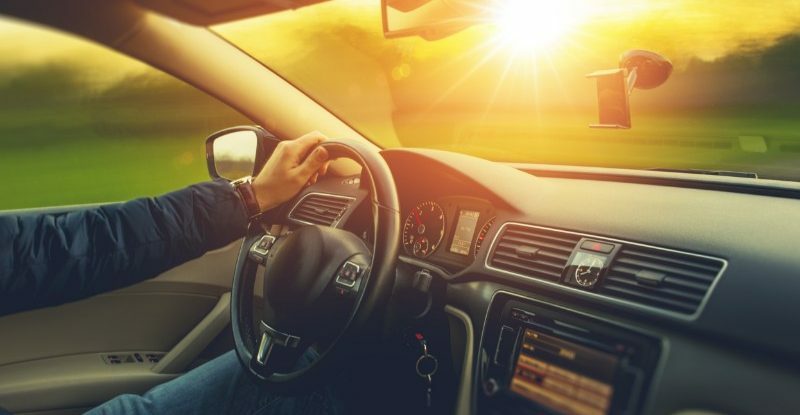 No one wants to get pulled over or find themselves in a car accident, but sometimes the unfortunate happens, especially when driving long distances. Don’t let an already bad situation get worse by being unable to find your important documents in the chaos of your glove box! The Sterling Car Document Holder helps you avoid this embarrassing and frustrating possibility by keeping all your important paperwork in a convenient location. This set comes with four of these stress-reducing wallets, so you can have one for each of your family’s vehicles! Whether you’re headed to the beach for the day or for the week, staying organized is essential. Instead of sorting through a jumbled mess of a trunk upon arrival, use the TrunkCratePro Organizer to keep all your belonging compartmentalized and easy-to-find! You can even customize how many compartments you use by placing or removing the adjustable dividers, allowing this organizer to adapt to your specific needs. Oh, and it’s not just great for vacation. Imagine driving home without half your groceries escaping their bags. Now that would be great! You can never go wrong with more storage solution for your vehicle. The IPELY Headrest Hanger Hook turns the back of your seat into an easy-to-use storage innovation. Hang your purse, your fresh-pressed clothes, or anything else you can think of in a convenient location that is easy to reach and secure enough to trust. No longer do you have to worry about items getting lose and rolling around the floorboards or snacks being just out of reach. With an 18-pound holding capacity, these hooks can hold pretty much anything you need accessible during your travels. Tacky tree-shaped air fresheners are a thing of the past. Not only does the California Home Goods Air Freshener have a superior smell and aesthetic appearance, it also uses better methods to freshen up the stale air in your car. This bamboo charcoal deodorizer naturally purifies the air as it removes unpleasant smells, leaving air not only smelling better, but better to breathe. This can be an invaluable addition to any road trip, especially is you travel with children who have a habit of spilling things in those backseat cracks that are impossible to clean. Crumbs and spills seem to always seem to find a way into the most inconvenient places and stain the most conspicuous areas. If you have the lebogner Car Seat Protector, you can say goodbye to dirty seats and finding cracker crumbs three months after you last ate crackers. These easy-to-install protectors defend your seats from unfortunate accidents and everyday wear-and-tear. They also include a rear kick mat, effectively eliminating those unsightly scuffs your kids tend to leave. An added bonus? There are even mesh pocket on the back of these protectors, allowing you to store travel items in a secure, accessible area. Keeping your valuables safe while on-the-go can be a challenge, but thanks to the Bestop Lock Box, you can rest easy at night. Constructed of tough 16-gauge steel, this lockbox offers plenty of secure storage to house all of your important items and documents as you travel. It includes a pick-resistant lock with two keys and a theft-resistant security cable to keep it wherever you choose to place it – perhaps under one of the front seats in your vehicle. You can even bring it into the hotel with you for added peace-of-mind. Sitting in the same car seat for hours on end can not only get monotonous, but it can get painful. The Clever Yellow Car Seat Cushion aims to change that pain into comfort by offering an incredibly effective three-layer design. It has a breathable mesh layer, a firm, molded memory foam core, and a thin layer of ultra-plush foam at the top. This clever construction allows it to be both supportive and exceptionally comfortable without compromising the integrity of its shape. The cover is washable, allowing you to keep the cushion nice and clean, and the attached straps allow you to secure it to the seat for no-slip use! The gaps between car seats and center consoles is a portal to the abyss. Once something disappears into it, that something will never be found again. Thankfully, the Drop Stop fills those gaps and prevents you snacks, coins, phones, and other irreplaceable items from an untimely demise. A kit comes with two Drop Stops, one for the driver side, one for the passenger, and is constructed of high-quality neoprene that will last years on end. Those with furry friends know that they can wreak havoc on a vehicle, especially the seats. From muddy paws to endless shedding, pets have a special talent for making a mess. With the Plush Paws Seat Cover, you can travel with peace-of-mind knowing that your backseat is completely protected. It is constructed of a waterproof material that is heavily reinforced to resist the wear-and-tear of paws, claws, and anything else your pet throws at it. It’s easy to set up, simply attaching to the headrests of both the front and rear seats, and even includes two harnesses and seat belts to help keep your best non-human friend safe and secure throughout your travels. Powering your devices while on-the-go is not always about convenience; sometimes, it’s about necessity. Whether you need your phone for navigating unfamiliar territory or your laptop for working on that big project that’s due tomorrow, keeping your electronics charged is vital even on a road trip. The BESTEK Power Inverter allows you to do just that by turning your car’s DC outlet into a powerhouse that is complete with two AC outlets and two USB ports. It even has a built-in fuse to ensure everything stays protected! Not all car chargers are created equal, and the Anker PowerDrive 2 is here to prove it. Sure, this looks like your standard car charger, but when you look past the basic shape and dual USB ports, it’s actually so much more. Using impressive technology known as PowerIQ and VoltageBoost, this charger provides the fastest possible charging speeds. It also has built-in protections to keep your electronic devices safe. As if any more features could be packed into this incredibly compact device, there’s even a LED indicator light, allowing you to see once the sun has set. No more blind stabbing until you find the port! Keeping your eyes on the road, especially through the duration of a long trip, can be exceptionally difficult. Distractions abound in this modern age, and passengers can easily pull your attention from where it belongs. The WizGear Magnetic Vent Mount helps keep you and your occupants a little safer by mounting your phone where you can see it and the road. Whether it’s hands-free talking, using a navigation app, or quickly changing a song, these handy magnetic mounts attach to any standard vehicle air vent and allow for exceptionally easy one-handed use. You can even rotate your phone a complete 360 degrees, only adding to the convenience factor of this product. Whether you have a family or are traveling with a group of friends, sometimes you need a little extra storage space. The SportRack Vista XL Cargo Box offers more than just a little. It has an interior volume of 18 cubic feet, meaning it will house your clothes, your camping gear, or anything else you want to put on the roof and forget about. It features a rear-opening design that allows you to stay out of the path of traffic should you need access to your luggage while on-the-go and includes all the mounting hardware you need to hit the road. And you don’t need to worry about the safety of your belonging, either, thanks to the built-in lock that keeps everything secure. Extra storage capacity is almost always valuable when traveling, and the Reese Explore ProSeries Rambler makes adding that usable space as easy as having a hitch receiver. Maybe you’re carrying tailgating supplies to the big game or heavy necessities for you camping trip. Either way, you’ll be set with this carrier’s 500-pound load capacity. The 5.5″ side rails are perfect for keeping cargo secure while driving and the durable powder coat finish is sure to ward of wear-and-tear from your cargo and the elements. While rooftop cargo carriers are fantastic, they are limiting. They’re expensive and require that your vehicle have a roof rack. The RoofBag is a versatile alternative that is less expensive and doesn’t require any sort of roof rack. It’s waterproof, made in the USA, and is durable enough to withstand the abuse of long road trips at highway speeds. The high-quality construction included heavy-duty straps to help secure the bag and is large enough to house pretty much anything you throw at it, up to 15 cubic feet! While it would be pretty amazing to bike across several states and then bike some more, sometimes it’s more realistic to carry your bikes (and other belongings) to your destination with your vehicle. The Allen Sports Bike Rack utilizes your vehicle’s 2″ receiver to carry two to five bikes depending on which model you purchase. In other words, there’s a bike rack for you, whatever your needs or the needs of your family are. The arms of this carrier fold out of the way when not in use, and the mount includes a lock with two keys to ensure your valuable bikes stay yours! An air freshener is always a good idea! It is an especially good idea if you’re in your car a lot, and are battling the smells of food, kids, pets, and the like. Febreze is a favorite for many reasons, and this 4 pack easily attaches to your car vents so you’ll be smelling fresh in no time.